After the blow of not winning a scholarship, I felt resentment building up about English Literature. I had read everything, and worked so hard, but it had not been enough. Not knowing anything about Dweck and ‘Growth Mindset,’ I declared that English was ‘not my thing,’ and proceeded to throw myself into other aspects of university life. And third year was in some ways a really wonderful year. I worked for the university newspaper, and for the first time my work felt purposeful. I wasn’t serving drinks to make a pittance, and I wasn’t slaving over books to fail to win a scholarship. I was writing, writing, writing and copy editing; spending whole days and whole nights in the newspaper office over a production weekend, and making actual friends who also got a kick out of working insane hours to produce something concrete at the end of two weeks. I absolutely loved it. Getting involved in university also had other perks. I found out that there were events that had free drinks, if you only knew the right people, and suddenly I had something of a social life. I worked in a shop, not a bar, so I had evenings free and could actually socialise the way other people did. The downside of my shop job was, after Christmas (when they had employed a huge amount of extra staff to deal with the massive Christmas bonanza), they kept on far too many of us, which meant there weren’t enough hours to go around. I went from working twenty-five hours a week in term time to being rota-ed for about ten. It was not even enough to pay my rent. But others who worked in the shop were sometimes flaky. Although my availability for hours was weekends and times when I did not have lectures or seminars, I would often get a call: ‘can you come in for six hours? Someone hasn’t shown up.’ And I would go in. Third year was the year I started skipping lectures. I didn’t make a habit of it; except that I did, because they always called to offer me hours, and I always said yes. I didn’t want to miss classes, but I did. When I turned up to the classes, I had done the basic reading but nothing more. I had stopped reading anything to accompany the texts. When I knew I would miss the lecture or the tutorial I didn’t read the text either. I was scraping 2.1s on my essays, which I would painstakingly draft and re-draft in the hum of the newspaper office in between churning out articles and re-writing other people’s. In the newspaper office, I learned the difference between a dash and a hyphen, and when to use a semi-colon. I learned how to check sources and get quotes and find stories. But I did not learn much about English Literature in my third year. Before exams, the hours had dwindled ever more. Others were feeling the pinch; for some, this was their full time job, and they were working less than 20 hours a week. I resigned just before exams, hoping others could take my hours. I went for a newspaper-related scholarship. After all, I had given up evenings and weekends (in between shifts) to the newspaper. I thought I stood a good chance. The end of third year brought both good and bad news. I did not win the newspaper scholarship. It turned out, being involved in university societies meant you made enemies as well as friends. The good news was that I had a new job. I was working in a theatre, selling tickets. It was a different world. For one thing, I got to sit down all day for the first time in three years. For another, they were willing to give me ten-hour shifts six days a week during my university’s summer holiday (on the seventh day, I worked as a teaching assistant at a weekend programme for young people; soon, I was a drama and creative writing teacher there). And finally, when the phone wasn’t ringing or customers weren’t queuing, I could read. It was the perfect solution to my problems. No longer exhausted and run off my feet earning minimum wage, suddenly I could draw the wages of a king (€10.50 an hour!) for sitting and reading. I saw Riverdance five times, and loved it each time more than the last. In the summer, I looked up my exam results online. 66%. I’d got a 2.1. In fact, I had dropped only one per cent from my first and second year results. The difference in notattending lectures and not spending 8 hours a day in the library was one per cent. Next week, I will write about my final year of university. You can read about my first year here, and my second year here. 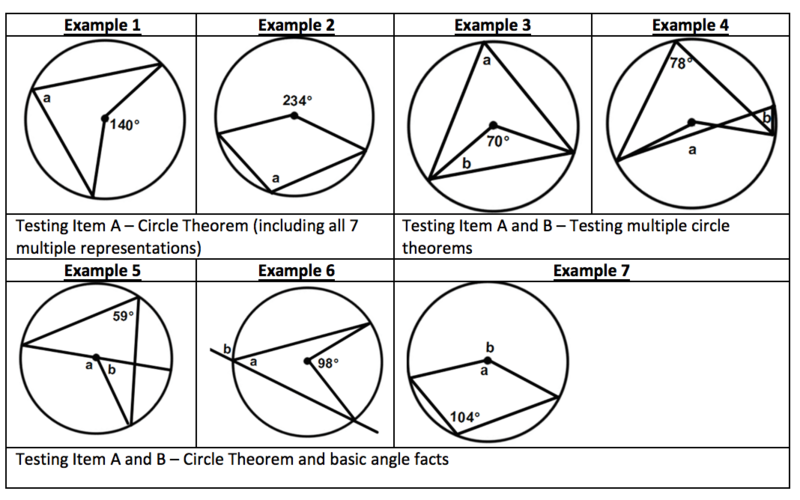 Last week, I explored different number based circle theorem problems that can test (a) a pupil’s ability to identify the circle theorem being tested and (b) problem types where a pupil has to find multiple unknown angles using their circle theorem knowledge as well knowledge of basic angle facts. Equating two algebraic expressions which represent equivalent angles and solving for the value of the unknown. Furthermore, using the value of the unknown to find the size of the angle represented by the algebraic expression. I have interleaved fractional coefficients into a couple of questions to add some arithmetic complexity to the questions. Enjoy! 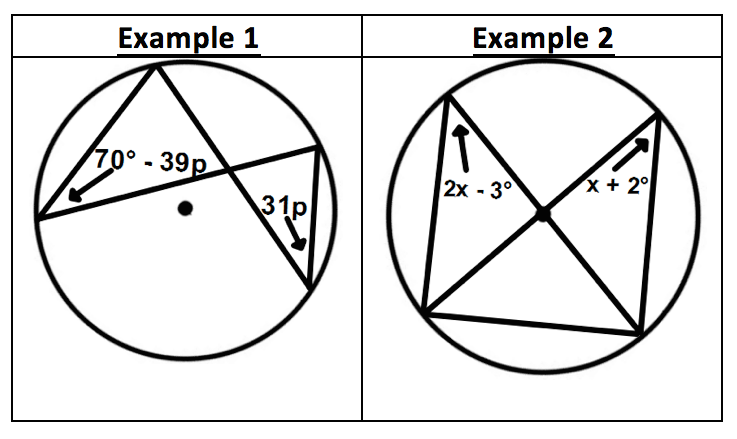 The questions for this circle theorem differ in nature from the problem types shown above. Here you are equating two algebraic expressions which represent equivalent angles. We are no longer forming a linear expression and equating it to an angle fact like 180o. Alternate Segment Theorem – The angle between a tangent and a chord through the point of contact is equal to the angle subtended by the chord in the alternate segment. I would be keen to hear any thoughts or feedback. Please don’t hesitate to email me on naveenfrizvi@hotmail.co.uk. 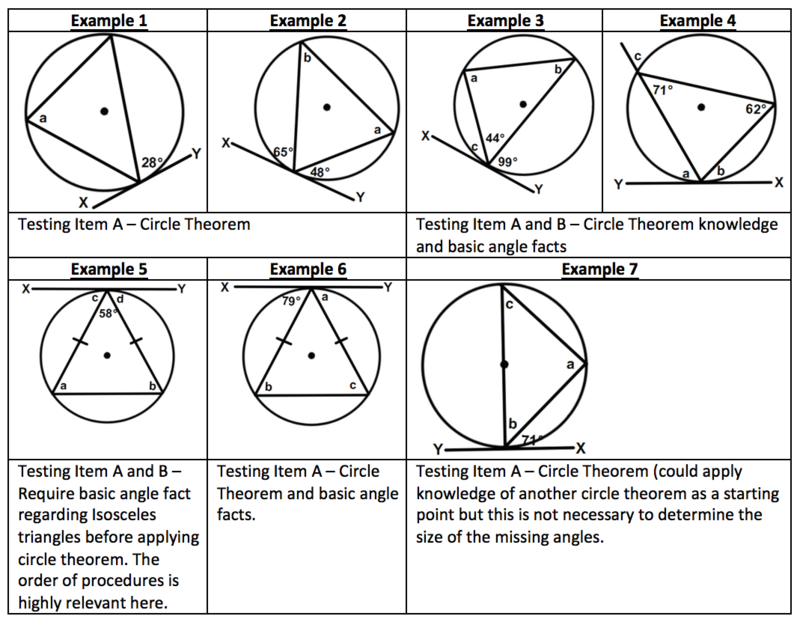 Last summer, I made as many different problem types for the topic of Circle Theorems. I looked through different textbooks and online resources (MEP, TES, past papers). 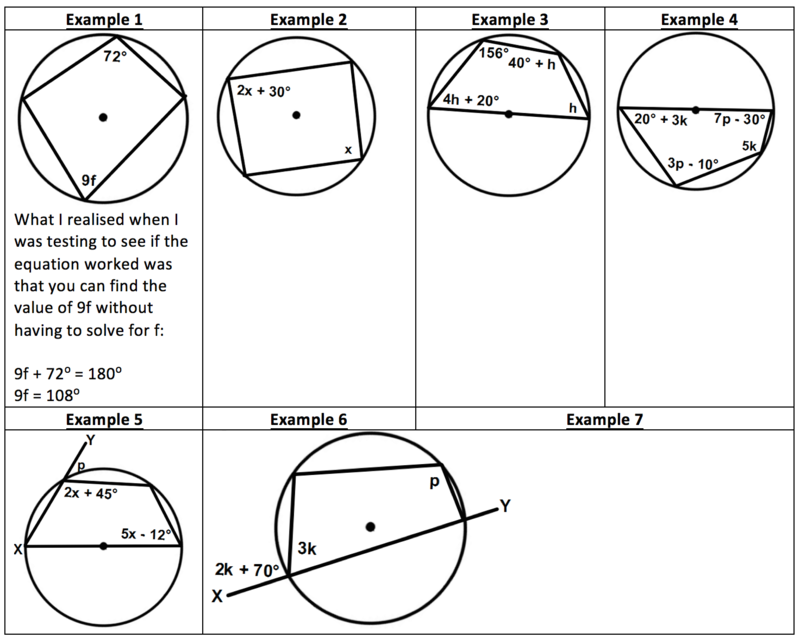 I did this because when I last taught circle theorems at my previous school there weren’t enough questions for my pupils to get sufficient deliberate practice. This was a two fold issue. Firstly, I would find a practice set of questions which would not provide enough questions for a pupil to practise one particular problem type. Secondly, the sequencing of questions in terms of difficulty would escalate too quickly or not at all. Here I will outline the different problems types I created (using activeinspire) and then explain the thinking behind them. I have been very selective with the problems I have included here; I have made more questions where certain problems types are more complicated which I shall discuss at the end. I shall more in the following posts. I made two different categories of problems for each circle theorem. 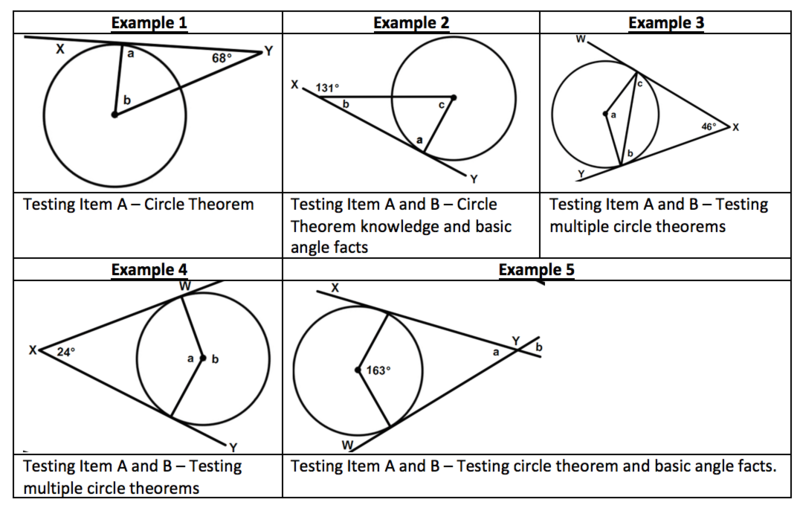 The first type would explicitly test a pupil’s understanding of the theorem to see if they could identify the circle theorem being tested. The second type would be testing two things. 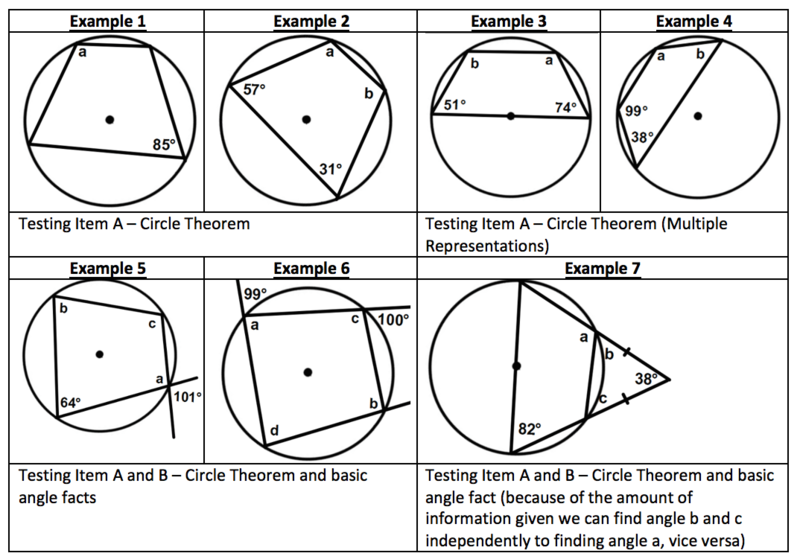 Firstly, such a problem type would be testing their ability to determine the circle theorem being applied in the question. The second aspect of the problem type would be testing related geometry knowledge interleaved which can be calculated as the secondary or primary procedure in the problem e.g. finding the exterior angle of the Isosceles triangle. Figure 5: The angle subtended at the centre of a circle is twice the angle subtended at the circumference Figure 6: Tangents to circles – From any point outside a circle just two tangents to the circle can be drawn and they are of equal length (Two tangent theorem) Figure 7: Alternate Segment Theorem – The angle between a tangent and a chord through the point of contact is equal to the angle subtended by the chord in the alternate segment. 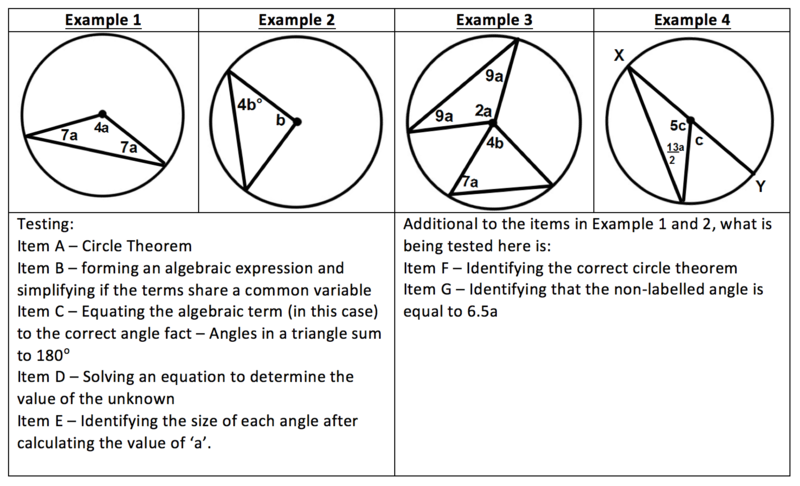 Interleaving the application of multiple circle theorems. as an independent step in the procedure where finding one angle is not necessary to find another angle. I would be keen to hear any thoughts. Please don’t hesitate to email me onnaveenfrizvi@hotmail.co.uk. Since starting at Michaela in September, I’ve learnt that every second counts. I’m still shocked at the speed of routines, and how they enable us to squeeze every last second of learning in every lesson. There are lots of things that slow lessons down which Michaela has almost managed to eradicate. For example, chaotic corridors at lesson transition time, settling pupils into the classroom, lengthy periods wasted waiting for silence, and time-draining activities that yield less learning than alternative methods. In science, the added pressure of getting through experiments requiring lots of equipment can further remove the focus away from learning. 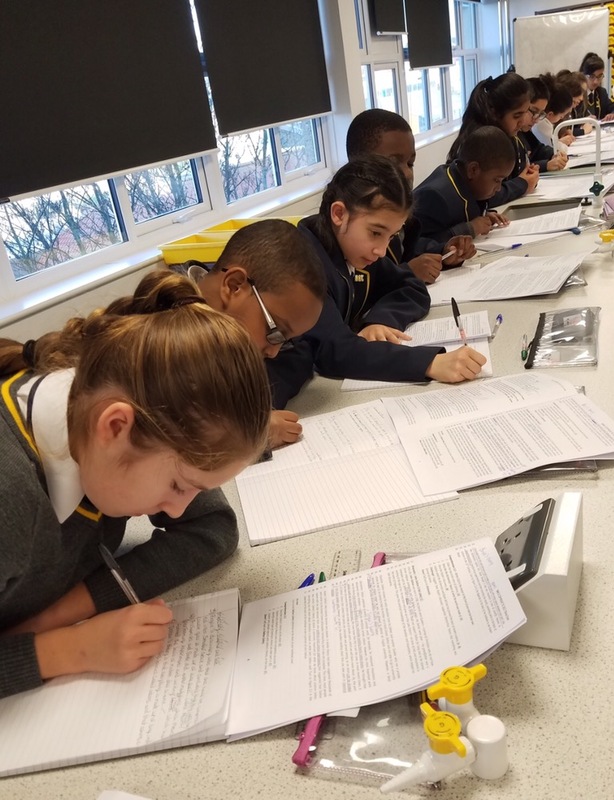 To demonstrate exactly what this looks like in practice, here is an outline of a typical Michaela science lesson, broken down minute-by-minute. This would work with any class, but this lesson in particular was with a year 7 set 3 class – their second lesson on a new chemistry unit. The title of the lesson was ‘Evidence for atoms’. Times are approximate. 10:30 Pupils are waiting patiently outside the classroom in silence whilst another class is dismissed. 10:31 Pupils say a hearty “Good morning” as they come in to the class, take their pencil cases out and are then SLANT-ing. 10:32 “Good morning year sevens. Drill questions page 3. Ready…go!” Pupils sit, hand out exercise books and immediately start their drill questions on page 3 (see more on speedy entrances here). Drill questions are one worded answers to recap over the whole unit. 10:34 I say “3,2,1 SLANT” to get their attention. I tell them to get their green pens (for self-checking) ready. “Ready…set…go!” I read out the one-word answers to each drill question and ask for class feedback. “Hands up if you have question one incorrect?…two incorrect? Etc.” The majority of the class puts their hand up for question 7, so I provide a brief explanation and recap on Aristotle and the four elements. 10:36 “When I say go and not before, recap questions at the back of the book. Ready…go!” Pupils complete five recap questions in silence. Recap questions are sentence answers linked to the previous lesson. 10:42 “3,2,1 SLANT. When I say go and not before, tracking line one. Quickest row gets to read first. Ready…go!” Pupils put two hands on their ruler holding a blue pen in one hand. Each pupil reads one line each of the text and annotates their text book accordingly. 10.47 We pause after line 9 for questions. “3,2,1 SLANT! During which period were Alchemists practising?” More than 50% pupils put their hand up. I non-verbally ask for a choral response: “1,2,3….” “Renaissance!” After a few more questions we continue reading about Robert Boyle (and his theory) with frequent pauses for questioning. “That’s great! What must you remember? 1,2,3..” “Capital letters at beginning of sentences!” “Ready…go!” Pupils start their comprehension questions. 11:09 “3,2,1 SLANT. Green pens ready. Ready…set…hands up! 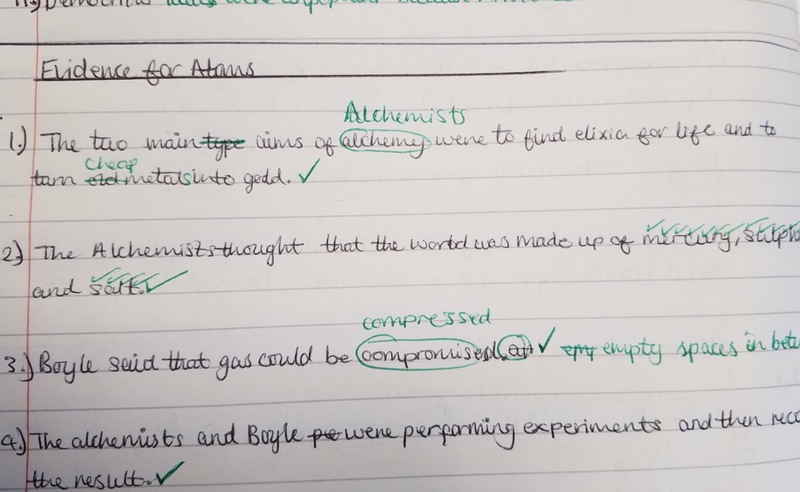 Question 1…” Sarah: “The two main aims of Alchemists were to find the elixir of life and to turn cheap metals into gold, Miss” “Great answer, merit for Sarah. Now check your spellings for Alchemists. A-L-C-H-E-M-I-S-T-S” Pupils check by ticking every letter. 11:13 We continue to read about John Dalton, again pupils annotating their textbooks and pausing for questioning. 11:18 Pupils complete second set of comprehension questions. 11:23 “3,2,1 SLANT. Green pens ready. Ready…set…hands up! Question 1…”Pupils give whole class answer in a similar fashion as the first comprehension. 11:30 Pupils are dismissed, filing out into the corridor. It’s always lovely to hear a “Thank you, Miss” when they leave. Another Michaela lesson complete. The simplicity of each lesson and the consistency of routines enables maximum learning to be achieved. Click here to see a minute by minute history lesson by Mike Taylor. I’ve had two interesting conversations this year with some of our weakest pupils. Fadekah is in Year 8. For all of Year 7 we despaired if she would even be able to pick and microwave her own meals, or complete routine tasks to earn a wage. She was a seriously spaced-out kid, if very sweet. She never did her homework, and would wear a dopey expression of “I’m cute and helpless and can’t do anything” when her form tutor chastised her for this. Sometimes she giggled if she was being told off. Everything seemed to pass her by. She struggled with the simplest of abstract concepts and didn’t know any times tables. She didn’t know the number before 1000 and seemed unable to remember it no matter how many times I told her. In lessons she did little work, grinning in a far-away manner if given a consequence for not working or not listening. I didn’t see how she could get a G, let alone a C, in Y11. I didn’t see how she could have a good future. At the start of this year, I had her class again. On the first day she was the star of the lesson. That night she did her homework. And the next night, and the next. She came after school frequently to ask questions about what was learned and took copious notes recording explanations and tips I gave in lessons. Her test results are now typical of the class, despite finding the material difficult to grasp and often feeling confused by the work (Year 8 is mostly algebra). She never needs to be corrected in lessons for not listening or not trying; she is frequently pointed out as a role model. Her questions are insightful and thoughtful. Her homework is always early, she often does extra. I asked at the end of September what had happened; why had she changed? That was it. She had nothing to add to it. She just decided, and then she did it. Another girl in the same class, Jana, had appalling results in maths, and every other subject. She struggled to answer the most basic questions (How do you get home? What’s 4+10?). I assumed she must have a very low processing speed and a very limited working memory. Even an instruction like “pick up your whiteboard pens” seemed to be received on delay. I decided in November that being helpful and understanding wasn’t the right approach; she was getting less than 10% in year group exams where the average always exceeded 70%. I tried being tough. In lessons, if I asked a simple question which she couldn’t answer, and then told her the answer and asked again and she still couldn’t answer (i.e. hadn’t listened), she’d get a demerit. In many lessons she would get two demerits this way, meaning a detention. I was worrying that I was punishing a child who maybe had a fundamental problem. At the start of this half term, she was different. She was answering everything. She was slightly slow, but her working was always clear and always led to good quality solutions. Her errors made sense and were typical of a Year 8 (i.e. she was doing as well as everyone else, making mistakes that reflected thought). Her hand was always up, provided there was thinking time. She asked good questions. She got lots of merits. I asked her what had changed. I couldn’t tell if that delighted me or made me furious. But she has maintained the change, and has stopped looking worried and lost in lessons. She seems to enjoy maths and feel proud of what she produces. I suspect she won’t turn back. These experiences underline for me how much of pupils’ underachievement, even where they seem like cognitive or social outliers, has a simple explanation. They are not listening properly, they’re not really thinking, and they’re hoping they can fly under the radar with minimal cognitive effort. They are not disrupting, but they are not learning. Their precious time at school is being squandered. Few normal (i.e. non ‘bright’) pupils get good results, or have good life chances, if they stay stuck in this rut. Teachers need to motivate and inspire these pupils, but we also need to keep them under constant pressure to listen carefully, think deeply and feel accountable for their work, both on the page and in their brains. These are the strategies that we have come up with in the maths department (with lots of input from Olivia Dyer, the head of science). Levelling up: Narrate why it is important to listen carefully and be ready for the teacher to return to them. Encourage pupils to remind you to come back to them (by putting hands up politely), thanking them for reminding you and taking responsibility for being held accountable. Praise it as behaviour that shows they really want to learn. Everybody answers: before you accept answers to a question, every pupil writes their answer down. This gives more thinking time to the slower thinkers. It also holds them accountable, as it is visible if a pupil is writing or not. This is common in maths with the use of whiteboards (provided there is a good routine in place for pupils to write the work in a secretive fashion and show it simultaneously, so that pupils can’t copy each other). a. Looking at the question on the board, with an expression that shows ‘thinking’ (no vacant expressions). This is usually a focused or intense face. Some pupils faces really screw up their expression when they’re thinking, some look quite calm. This depends on you knowing your pupils, but the absence of focused thought is generally quite obvious. b. Looking at the question on the page, with a thoughtful expression (as above). c. Doing working on the sheet / whiteboard. In maths this is typically jottings for a calculation, or other things to relieve the burden on working memory. d. Hand up, waiting to answer. With some classes, I’ve said “If you stare vacantly at me once I’ve asked the question, instead of looking at the diagram, I will know you are wasting thinking time. That means we’ll have to wait for you, and is stealing time from the people who started thinking straight away.” I’ve moved to giving a demerit if they persist in it after the warning. That might seem harsh, but the explanation of why I do it means the pupils seem to find it very fair (it’s always palpable when pupils think something is unjust!) and the quality and pace of responses has jumped up. I wished I’d moved to this sooner. a. If more and more hands are gradually creeping up, the coasting pupils think “Yikes! Better think of an answer” as their non-participation is becoming obvious. If you really want to keep them on their toes, you can ask the 1-2 without hands up to tell you what the question was. If they know, but can’t answer, that’s fine. If they don’t know…make clear this means they are throwing away a chance to learn and to test themselves. b. If the number of hands going up stops, you know the problem is probably you: you need to tell them again, and make it clearer. You also might need to improve the question, so it is also clearer. 7. Pause before asking for hands up. Give the thinking time, then say ‘hands up.’ This means many more hands go up at once (giving the message “It is normal to participate in this classroom” “It is normal to be eager to answer”) and slower pupils aren’t dispirited by their neighbour who has an answer before the teacher has finished speaking. 8. Show almost all of the question, but leave out the final element. This means no one can put hands up until you are ready, but they can begin thinking. For example, you could give this simplification: 4a3 x 5b? and leave the question mark blank for 5 seconds, allowing them to plan their answer for the rest of the question. This gives the slower thinkers time to catch up, and creates a slight element of drama when the number under the question mark is revealed. To be clear, the strategy above isn’t helping them connect ‘isosceles triangle’ to the definition. It is probably only helping them to remember the name of a triangle that begins with i. But, it can be a good way for pupils to see they know more than they realise, and to build up their confidence. It also helps you see if the problem is remembering a word at all, or connecting it to a definition. 10. Reverse the question. If you’ve asked a question, like the isosceles one above, you can reverse it straight away: “Tell me two special features of an isosceles triangle.” Assuming you made sure that everyone listened to the first answer, it is now not acceptable to not know the answer. This makes clear to pupils that they need to really listen to your questions, not just jump to answers. 11. Interleave questions. If pupils are struggling to match together a word or procedure and its definition or process, or to explain a concept, you need to ask it several times. However, repeatedly asking the same question means pupils quickly start to parrot back sounds, rather than strengthen the connection between words and ideas. Interleaving the important question with other low-stakes facts that they know forces them to listen more carefully and to do more recall (rather than repetition). For example, if the key question is how to find the sum of angles in a polygon, you might mix it in with easier questions like “What does n stand for in the formula?” and “Which polygon has an angle sum of 180?” and “What is the formula for the area of a triangle?” This forces more thinking and practise of contrasting the new answer (the formula) with other faces that seem similar. d. The teacher calls each of the options and pupils raise their hand up a small amount (so the movement is imperceptible to their neighbours). It is important the teacher gives the same amount of time for each possible option, so as not to give away the answer. Counting to 4 in your head can help. e. “Heads up!” …give them a few seconds to readjust to the light… Having their heads in the crook of their arms means they don’t get as zoned out as having it straight on the desk, which is also helpful! 2. Routines for whiteboards that keep answers secret from each other (described above). You must narrate why it is not only important not to look at others’ boards, but also why keeping one’s own board secret it essential. Narrate how it might seem kind to let someone see your answer, but it is in fact unkind as it stops them from getting the help they need. Levelling up: I have recently moved to giving pupils demerits if they show me the wrong answer with no working. This has made a huge difference in two ways: it means that children who are quick thinkers are forced to slow down, so the others aren’t intimidated or disheartened when they need more time. It also means I don’t waste time trying to guess where they went wrong. Full working allows me to quickly identify the point of error and give better feedback. Because this was narrated and ‘trialled’ for a lesson, the pupils who had demerits for this weren’t upset when they got a consequence and, more importantly, have changed their ways. b. Posing a question to check competency/understanding, telling them to wipe their board quickly and start the exercise if you tell them they’re correct. c. As you see each correct answer, saying simply ‘correct/well done/correct’ and letting them get on with it. d. Get a show of hands of who has not started the exercise, then tell those pupils they are going to see more examples and be asked more oral questions. I find that, once I start on the re-teaching, many pupils then say “Oh! I get it now” and then they join in the written exercise, quickly narrowing down how many I am trying to help. For short-form questions (i.e. those requiring only 1-2 steps), go through it first as an oral drill, cold calling pupils. Then, use it as a written exercise. There are several benefits: every pupil has had a chance to ask for clarification on questions where they don’t understand why that was the answer, or to note down hints to help them start it on their own; pupils can begin work quickly and in earnest, knowing that it is something they can do with more confidence; you get twice as much ‘bang for your buck’ with an exercise. This works best for things that are highly procedural, but I think it also works well for questions where the ‘way in’ must be found. If a good chunk of the exercise has been done orally, the written attempt will still require them to recall and decide how to begin. Drill on step 1: If the exercise is focused on decision-making (e.g. an exercise mixing all fraction operations, where the main challenge is that pupils muddle which procedure goes with different questions), it can be done as an oral drill just for step 1. For example, “For question a, what will you need to do? Find the LCD. Question b? Find the reciprocal and multiply.” This can be a lower-stakes version of the exercise to allow you to check how ready they are before embarking on the more extended task of completing the calculations. Before starting exercises, particularly more extended ones, or quite visual ones (e.g. an angle chase), give the pupils 30-60 seconds to scan for any that they think they don’t know how to start. Then, give hints and tips for those (depending on the pupils, you might model a very similar one on the board for them to look at when they get to it). This prevents you from running around from pupil to pupil as they encounter the problem, and gives them confidence when they get to it…and no excuse for just sitting there waiting instead of attempting it! If several pupils are struggling with the same thing, or asking the same question, or making the same mistake: STOP THE WORK! Make them all listen to the additional instruction, explanation or example. This prevents you from creating lots of low-level noise as you help others, and gives help straight away to them all. Culture of Thinking: do I understand this? Did ____ happen because _____? Is ____ like this because _______ is like that? If that is the case, does that mean that ____ is the case? Is this similar to the way that _____? I thought that because _______ we couldn’t ________? What happens if you try it with 0 / 1 / 2 / a negative number / a non-integer / a power? I think there is a pattern in this. Is it __________? Will the answer always be positive/negative/an integer/a multiple of __? I have an idea to help remember it: ___________. Praise such contributions! Narrate that this is the sort of thinking that makes someone good at your subject, and makes it stick as they are forming connections with other ideas. Their memories of the ideas will be richer and more powerful. You can also narrate how this is beneficial to the other pupils, and to you as a teacher, and express gratitude. Culture of Thinking: What do I need if I want to succeed? …but is pointless if they are simply repeating sounds. It needs to help them put ideas together, or be a low-stakes way to practise recall of facts or saying tricky words. 2. Use as many memory aids and links as you can. They more ways that pupils can recall something and know that they are remembering correctly, the better. There is no use in a pupil correctly recalling the process to find the median if they doubt they have it correct. That is nearly as bad as not remembering at all, as it will feel futile to proceed. Even the weirdest memory aids can be valuable: my Y9s suggested remembering median with two prompts: (1) think of it as medIaN, because it is IN the middle, and (b) it sounds like medium, and medium is the middle size. These are not sophisticated, but it allows them two have two ways to recall the process, and two ways to feel they are on the right path. 3. Set a goal for the lesson. Our deputy head described this as being what a learning objective was meant to be (as opposed to exercise in the time-wasting that can be seen – and enforced – in many classrooms today). I sometimes start the lesson by silently modelling an example of the kind of question I hope they’ll be able to do by the end, then putting a very similar question right by it. This will be on the left of the whiteboard. Then I use the remainder of the whiteboard during the lesson. Often I can be only 15 minutes into the lesson before (some) pupils’ hands shoot up, thinking they know how to answer the ‘goal question.’ This puts positive pressure on the others, as it gives the message “We’ve been taught enough to be able to do this! You need to keep up!” and lets pupils feel smart, and feel intellectually rewarded, for paying careful attention. I hope these strategies are useful to you. We are trying everything we can to get 100% of our pupils to do well in their GCSEs (and generally, be smart and confident people), so would love to hear about other approaches. These strategies are, of course, in the context of a school culture that celebrates curiosity, a love of learning and the belief that hard work is the path to success. This post focused on some behaviourist strategies, which we believe are the most efficient and effective approach, but in the bigger picture we focus on goals for the future and the instrinsic motivation of being an educated and confident person. If you find it exciting to think about strategies to motivate and challenge children who often fall behind, consider joining us. Our ad is on the TES, or you can visit our website. You can also email me on dquinn [at] mcsbrent.co.uk if you want to know more. What can we learn from a top private school? King’s College School Wimbledon is one of the most academically successful schools in the world. 96% of pupils achieve A*-A at GCSE, and 41 pupils gained A*s in every one of their exams. 25% of their pupils achieved 45 in the International Baccalaureate, which put them in the top 1% globally. 56 pupils won places at Oxford and Cambridge Universities. In October, I went to visit. On a bus on the way just before 8am, I overheard a conversation between two King’s boys. They were practising speaking in Russian for a test. They were learning this as an extra-curricular language and preparing for a trip to Moscow at Easter. It would be easy to dismiss Kings’ results as impossible for us in the state sector to replicate: their expensive fees, high funding, lucrative facilities, academic selection, high-achieving-only intake, highly invested parents. They own a cricket pavilion, expansive playing fields, a swimming pool and even a boathouse on the Thames that they share with Cambridge University. State schools will never have the money, intake or facilities that they have. Nevertheless, there is so much that can be learned from Kings, and other private schools, if we approach them in the spirit of an abundance mentality. Their success need not detract from our own in the state sector, but can contribute if we seek out ideas that could help us improve. Here are some of the ideas that I learned from my visit. ‘We were not only exposed to high culture, but completely immersed in it, day after day, as the backdrop and foreground within which our development took place. Here, aesthetics was not a cerebral pursuit for ageing dons – it permeated everything, and infused us with a sense of awe and humility that forced the eyes, even the soul, to look upwards in its educational pursuits. We were encouraged to reach for the stars, not future salary scales. This exposure to high culture [showed] an instinctive commitment to and formation within a higher aesthetic.’ This is uneasy and unfamiliar territory for many (but by no means all) of us in the state sector. Teachers teach didactically and unashamedly from the front, and lessons are heavily teacher-led; pupils sit in rows facing the front; textbooks, exercise books and pens are the default technology, even up to sixth form; simplicity is the watchword: in English, the main resource is simply class texts. The tasks tackle extended subject practice with limited variety: reading, writing, comparing examples, noting, discussing and summarising. For many veteran teachers at King’s, this seemed to be straightforward, no-nonsense common sense. The message that hard work is the only way to succeed is everywhere: in every assembly, pupils give a musical performance, and then explain how hard they had to work to practice, persevere and resist the temptation to give up; in every lesson, the focus is on thinking hard about the subject and maximising pupil cognitive work on tasks; every evening, pupils and parents are clear that they are expected to produce two hours of homework. Hard graft is celebrated and admired. Teaching writing is heavily guided, even up to sixth form. In History, for instance, starting point sentences are shared for each paragraph of complex essays on new material. Extensive written guidance is shared with pupils. Sub-questions within each paragraph and numerous facts are also shared. Excellent examples are continually shared as feedback. In English, the best essay is photocopied, handed out and meticulously annotated so that others begin to internalise the mental models of success. Exemplars, combined with redrafting, are the simplest way for teachers to give guidance on how to improve. Introductions are the vehicle of choice for improving essay writing. One-sentence thesis statements are set out to frontload and signpost the essay, and this is taught from Year 9. They are very easy to share and compare. A bank of exemplar thesis statements can therefore be built up, with teachers collecting lots of excellent pupil examples. Extensive homework is set at two hours a night in Year 9. In History and English, extensive written homework is set, collected, marked and returned. Over the holidays, two 2-page essays were expected of Year 10 over the week-long half-term. It was simply scored out of the same denominator (i.e. always out of 25) for comparability. Massive amounts of rigorous, independent subject practice are being done by King’s pupils, which sets them up to achieve A*s.
Pupils frequently enter national subject competitions such as Oxbridge essay prizes. There are sports fixtures, choir and orchestra performances, music concerts, drama performances and debating contests organised throughout the year. Form tutors go over King’s kindness commitment every term, and it is in every pupil planner. A culture of kindness is seen as a collective responsibility. Sixth formers mentor and teach youngsters in Key Stage 3. Sixth former had set up their own drama club, for instance, and produced and performed their own plays. Captains are appointed for sports, debating and general knowledge teams. Prefects are also appointed to take on leadership roles in the school. When I was there, I asked several pupils what they most liked about the school. All said similar things: ‘the atmosphere: everyone gets on here’, and variations on that theme. None of these things is irreplicable for a state school; they do not rely on extensive funding or a selective intake. Any school in the state sector can learn from these ambitious, common-sense practices that could help us improve the education we give to our pupils. The challenge for us is to show that scaling Mount Improbable is not impossible. Next week, I will write about my third year at university. You can read about my first year at university here. A similar problem afflicts history teachers. We can drill pupils all we like on significant dates, people and places, but that does not, on its own, give our pupils the vocabulary to express what these dates, events and people mean. Unless history is to become ‘just one damn thing after another’ we need our pupils to be able to know what I call ‘vertical’ as well as ‘horizontal’ vocabulary. If the names of dates, people and places help our pupils to describe the ‘horizontal’ narrative of history, our ‘vertical’ vocabulary expresses the themes that link seemingly disparate periods of history together. This is the vocabulary that we need to express change and continuity, cause and consequence, conflict, power, economy and ideas. Crucially, this vertical vocabulary is always domain specific: the causes of the First World War and the causes of the Enlightenment will require different explanatory toolkits. An how are our pupils expected to master this vocabulary if we are not the ones to give it to them? The big mistake that I made when I first started teaching was to presume that this ‘vertical’ vocabulary would just be discovered over time. I think there are many of the ‘enquiry’ bent who still think that this is something that just appears via osmosis. But I now see that this is as much as a nonsense as presuming that pupils will discover any other form of knowledge. Words like ‘tension’, ‘consolidated, ‘exacerbated’ which express historical ‘analysis’ are as much a form of knowledge as ‘King John’, ‘1215’ and ‘Runneymede’. Pupils must be explicitly taught such vertical vocabulary (and even occasionally make mistakes with it as they use it in different contexts) so that an initially inflexible concept bends and flexes over time. Over the last two years, we’ve toyed around with various different ways to teach our pupils what a good paragraph looks like, each time desperately trying to get away from the straightjacket of PEEL and towards an understanding of paragraph formation that actually concentrates on what it is that the pupils find most difficult. As the English department have found, ‘this demonstrates…’ is not the part of the paragraph that pupils find the most challenging; it’s what comes next. 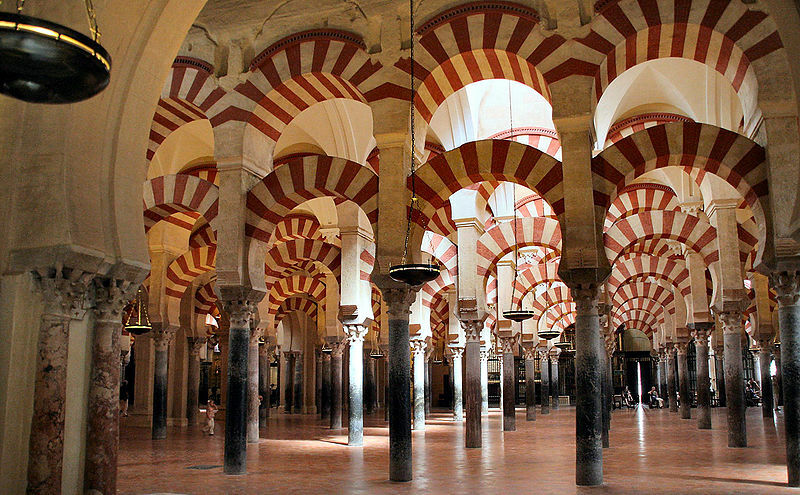 The challenge for history teachers is not just making sure that our pupils remember the ‘horizontal’ vocabulary of dates, people and places, but to remember the ‘vertical’ vocabulary, too. This is exceptionally difficult, not least because the vertical vocabulary pupils need to express themselves with sophistication changes between periods of history and therefore from unit to unit. Point: What is your answer to the question? Information: What dates, people and places have you remembered (we use this term deliberately) that support your point? So if we were preparing our pupils for a question on the causes of the English Civil War, we would use an example show them the sort of structure and vocabulary that we’d expect to see in a good paragraph. We broke this essay down for our weakest pupils so they had to write an essay which included paragraphs on religion, power and finance as well as a conclusion. Have we had to over-simplify it as a consequence? Yes, of course. That is the price we have to pay to give them the foundational knowledge that they will critique as they learn more. I haven’t here got into the debate about long and short-term causes, although colleagues teaching more able pupils certainly would. Here’s how we structured one of the model paragraphs on the religious causes of the Civil War for our weakest group in Year 8 (bottom quartile). The vocabulary that I’ve emboldened has been written into the booklets we use in class so that, by the time I get to the lesson, they should already be familiar with it. We need to be as confident that our pupils know the vertical vocabulary before an assessment as we are that they know the horizontal. Question: Why did the English Civil War break out in 1642? The English Civil War broke out in 1642 because of religious tension/enmity/division/animosity/hostility between the Puritan Parliament and the Arminian Crown. In 1625, Charles I married the Catholic French Princess Henrietta Maria. This was important because the Parliament was predominantly Puritan and it increased suspicion that Charles was a secret papist. In 1633, Charles appointed William Laud, an Arminian, Archbishop of Canterbury. This created further division because Laud attacked Puritans and banned their books. Finally, in 1639, this tension escalated into violence after Charles attempted to impose his English prayer book on Scotland. It was this final act that led to a Scottish rebellion which forced Charles to recall Parliament and sparked off the civil war. How is this different to how I used to teach paragraph construction? We’re not presuming that pupils will just discover words to express ‘tension’ and the changing relationship between Parliament and the Crown in the period – we’re explicitly giving them to the pupils. We create drills so that the vocabulary they need to express this changing relationship is automatized. We’re deliberately structured the evidence which supports the point in chronological order to help them remember the examples and to encourage them to think about how this relationship changes leading up to 1642. This essay was completed by a pupil in our weakest group in Year 8 at the end of last year (from memory). The pencil mark in the corner is the mark 15/25. What I was most pleased to see was the inclusion of the ‘vertical’ vocabulary that we’d be teaching in the lessons preceding the assessment. We’ve still got a long way to go on this, but I think it shows we’ve made a start. Michaela had always been open to anyone who wanted to visit, and we would actively encourage all kinds of people to visit us. We were so proud of what we did, and we naively thought that if only those who disagreed with us could see it in action – see how happy the children were, and see how much they were learning – they would have to concede that what we were doing was right for them. Unfortunately, our trust in teachers to do the right thing regardless of their preconceptions and biases was broken. Our guides began to report some guests being rude towards them and the school. Some guests were asking inappropriate questions of our guides, who were feeling increasingly anxious about dealing with these kinds of teachers. In December, we had to close our doors to visitors following a serious safeguarding concern. It has taken us some time to look into this concern, and to alter our policy on visitors to ensure our pupils are kept safe. Since publishing that blog, we have been inundated with emails, Tweets, and direct messages from those who expressed sympathy that we had to take such action; supporters of what we are doing who had really wanted to visit our school. We knew we had to put something in place to ensure that those people would have a chance to come in. Our pupil guides are incredible, but they are also children. Their confidence and articulate explanations can make even their teachers forget that sometimes, but they are still only children. When you visit our school, we are placing a huge amount of trust in you: to treat our children with kindness and respect, and to never forget that they are only kids – age 11, 12, 13 or 14. We are also placing a huge amount of trust in our guests to abide by our rules. I wrote before about some inappropriate behaviour of guests. Some people visit our school to soak up every piece of information they can, to find out more, to see what they can take back and implement at their own school. Some people visit with different motivations – to steal resources, or because someone has made them come when they would rather be taking ‘important’ phone calls while their pupil guides wait patiently for them. It takes a huge amount of time to organise the visits, to complete the logistics, and to train and support the pupil guides. We are happy to take this time if it is to benefit those who are visiting with the right motivation. So, what we need to do is to work out how to tell whether someone is visiting our school because they want to learn something, or whether they are visiting our school because they want to undermine what we are doing. When people visit our school with a motivation to undermine, not only do they write inaccurate and, frankly, untrue, things about what we do online (my favourite so far has been that teachers do not eat lunch with children – something every single teacher at Michaela does every single day) that damage other people’s perception of our school, but, far, far more importantly, that they put our children at risk. When people come, desperate to prove that what we do doesn’t work, in the face of the evidence in front of their eyes, they put our children at risk. We were hugely naïve to not recognise this sooner. All staff at Michaela, including our Headteacher Katharine Birbalsingh, visit all kinds of schools all around the country. Our visits have massively impacted on what we do. We often cite King Solomon Academy, Mossbourne, and Dixons Trinity as influencing some of our central ideas and policies, but we have learned something from every school we have visited – even School 21, which many consider our polar opposite, has taught us lots. Because we go to these schools with the mindset to learn. So we have now established an application process for visiting Michaela. If you email info@mcsbrent.co.uk, we will ask you to fill out a short form, which will be reviewed by Katharine Birbalsingh or a member of the Senior Team to decide whether the motivation is right. Those who have been kind to us or about us, those who are interested and want to learn from what we do, are welcome to come in. Those who have been rude to us or about us, those who are motivated by the wrong things, are no longer welcome to visit. Any visitor acting in a way deemed inappropriate will immediately be asked to leave. Some schools charge up to £50 per person per visit. We are happy for visitors to come in for free, as long as those visitors are supportive and will not put our children at risk. Our children are our top priority. Some of our guides are lower ability, and they have been genuinely upset by people visiting who do not like the school, who tell them that the school is bad, and that they are wrong to be happy at Michaela. We hope, desperately hope, that this new policy will be enough to allow those who wish to learn to come in, and to keep our most precious priority, our children, safe and happy. If you are interested in learning from what we do, please email info@mcsbrent.co.uk for an application to visit Michaela. In a recent conversation about university, I remarked off-hand that ‘I hated university.’ Given that I spent five years there, this is, one would hope, a melodramatic piece of hyperbole. I’m going to write about university in a series of posts, partly to make peace with my time there, and partly to consider some of the pitfalls of the experience which I hope we will be able to prepare our children for in the future. These posts are personal, and I don’t intend for them to be representative of anything other than my own subjective experiences. Why did I choose to go to university in Dublin? Looking back, it seems like a bizarre choice. My first year of university occurred before the ravages of top-up fees set in, and I was eligible for a full student loan at any UK university. Why travel to another country, with a different currency and, as a foreigner, have no access to student finance? I think the choice was a combination of arrogance and ignorance, not uncommon in 18-year-olds. Arrogance, because I had spent my life surrounded by loving family and wonderful friends, and I assumed I was completely content in and of myself and had no need of these pillars of support; ignorance, because I didn’t recognise quite how hard university would be – intellectually, socially, or financially. As a result, I paid for the first term of accommodation and had enough money to not work for my first term at university – if I could live on just under €70 a week. I wanted to focus on reading English and really understanding English Literature at university level. My understanding of what university would be like was formed by Kingsley Amis and Vera Brittain, and was hopelessly out of date. I envisioned evenings spent reading in a common room with hot chocolate, debating the vicissitudes of Victorian literature with equally eager scholars. The reality was somewhat different. One anecdote perhaps sums up this first year at university. I clearly remember Freshers’ Week because I was reading Ian McEwan’s Atonement. This may well differ from many people’s Freshers’ Week experiences. I shared a room with another girl, and I remember her getting ready to go out. A swarm of other first years came into the room, where I was tucked up in bed in pyjamas, merrily reading. They valiantly attempted to persuade me to join them on their clubbing adventure. I had not been to a club before (I did go clubbing a grand total of five times in my career as a student. I hated it each time) and adored my book. I stayed home and read. I attended every lecture, even the 9am ones. I queued for the library at ten to 9 every morning. I read everything on the reading list, and I read around each book. I sat at the front in lecture theatres. But I was also horribly out of my depth. I didn’t know what ‘dichotomy’ meant, and this turned out to be quite a pivotal word. Derrida and Fanon absolutely boggled me. I had literally no idea what Foucault was saying. I felt, perhaps for the first time in my life, stupid. Stupid, alone, and very far from home. A few months in, I plucked up the courage to say this to a fellow first year. To my shock, he said: ‘me too.’ I couldn’t believe it. It seemed like everyone else was having a brilliant time; but the reality was, I wasn’t alone. That conversation gave me the courage to go to my ‘mentor’ – the lecturer assigned to first years to be your helper. She was extremely kind, and said we could look into a transfer to a university closer to home if I was really homesick. But I explained that I wasn’t actually homesick. I was just sick of being broke. By term two, I was working long and unsociable hours – 6pm to 3am Thursday, Friday and Saturday – in a bar. The wages would just about cover my rent, and I lived off the tips. That meant I had between €50 and €120 a week to live on, depending on how busy we had been. Enough to live, and enough to eat; and for that I was very grateful. But closer to home I could get a loan. The lecturer gave me some advice – if it was money I was worried about, I should stay put. The university offered an extraordinary scholarship programme – free accommodation, including a free evening meal, plus the annual ‘student charge’ (around €750 at that time) paid until the end of your degree, including your postgraduate, and all your postgraduate fees. It seemed too good to be true. All I had to do was pass the scholarship exams in the second year. The hubris of youth burning bright within me, I decided to stay. I threw myself even more into my studies and stopped resenting work. I had a new goal: win a scholarship and stay in university. Next week, I will outline my experiences in the second year of university.